“Non-gluten,” “Non-dairy” and “Vegan” have become the new buzz words! For me, it’s nothing new. I was raised on a vegetarian diet before it became “Hip.” When I was growing-up, a good meal was a plate full of meat and potatoes but not for me and my eight siblings. My daughter, Marianna, made me the delicious pizza pictured above. It is low in carbohydrates, which means low in sugar. So, if you are prone to Diabetes, this is the pizza for you! This amazing pizza is made with all plant-based ingredients. For us, the crisper the cauliflower crust, the better. It was topped with a cashew based Alfredo sauce, fresh vegetables and Burata style buffalo mozzarella vegan cheese made mostly of coconuts. We found most of the produce for our pizza, including three kinds of basal, at our local Farmer’s Market! Grazing through the Farmer’s Market is always a fun mother/daughter expedition for us. It’s fun to support your local farmers. Try being creative in your food preparations and enjoy healthy, delicious alternatives in eating. EXTRA! EXTRA! EAT ALL THE PIZZA! ~ Start with Trader Joe’s Pizza Crust (Check link for cooking instructions). Take the Cauliflower Crust out of the oven and put your favorite ingredients on top. First, my daughter, Marianna used a dollop of Victoria’s Vegan Alfredo Sauce in the middle of the pizza and lightly brushed it around the pizza in a circular motion. Then, she added sautéed portabella mushrooms and white onions on top of the sauce and placed raw sliced heirloom tomatoes with purple, green and lemon basil, a colorful display! Sparingly, she scattered bite-size pieces of Miyoka’s Mozzarella Cheese on top with just a few sprays of Spectrums Olive Oil Spray. Broil for a few minutes more until the edges of the pizza begins to turn brown. Buon Appetito! Thanks to my daughter, Marianna for this healthy and tasty treat! 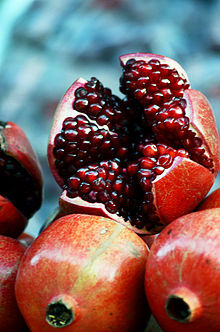 Pomegranates are an Intriguing and Powerful Fruit that stirs up the imagination. As I make my Pomegranate Jam, I think of the Shakespearean phrase, ‘Nightly she sings on yon pomegranate tree…’ and the memory of playing the part of ‘Juliet’ when I was eighteen years old without ever seeing a pomegranate tree or the fruit itself. This is odd because I was raised as a vegetarian. Yet decades later, there is a pomegranate tree growing in my backyard. Pomegranates are a Powerful Antioxidant! The pomegranate looks similar to an apple on the outside but inside the skin you’ll find a multitude of tiny berries that are beneficial to your health and beauty. Pomegranates are good for you! Can you eat the seeds in each juicy morsel? Yes, chew it good, the seeds contain oil, an isoflavones (also contained in soy) so it becomes creamy in your mouth. The juice squirting in your mouth from each berry is quenching and soothing to your throat. Also, feel good knowing that you are getting nutrients including 5 polyunsaturated fatty acid that helps with cell regeneration. Picking a Sweet Pomegranate… Beware of Creepy Bugs! I always pick fruit at the market that have markings on the skin because I know the bugs like sweet things too. Because of our hot summer, my pomegranates were already bursting on the tree. This made the seeds easy to get out. However, it invites creepy large bugs. Yuck! 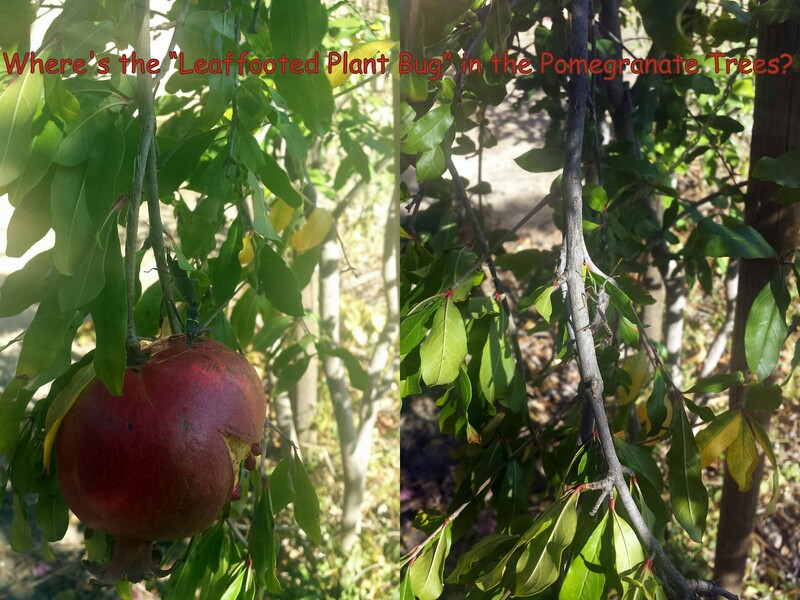 The bugs looked slow-moving so I carefully ventured into the tree to pick a pomegranate. What just flew above my head? Was it one of these bugs? Yikes, they fly! The Leaffooted Plant Bug was well camouflaged within the tree! I ran to my house to get my cell phone so I could take a picture of these little critters. Can you see the creepy crawlers? It won’t be easy to see the bugs but that’s what makes it fun! Are you game? Leaffooted Plant Bugs in the Pomegranate Trees! This simple pomegranate jam recipe contains no added sugar! It is sweetened with a little honey and lemon aid that I made from fresh lemon juice (lemons from my tree). 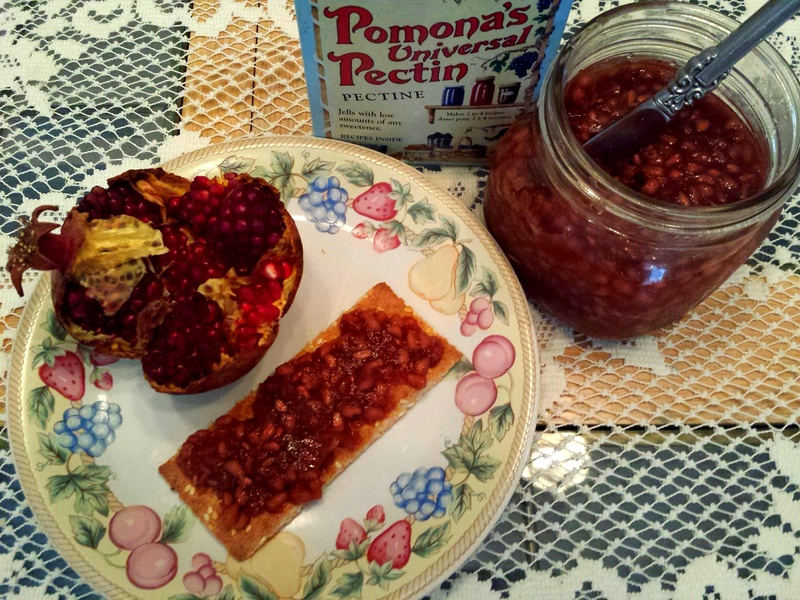 Of course, you’ll also need fresh pomegranate seeds and pectin (pictured). I suggest that you put on an apron so you don’t stain your clothing and wear tight fitted latex gloves (if not allergic to latex) to protect your nails. I soak each cracked pomegranate in water to cleanse it and then put it in water again to get the seeds out while the pomegranates are immersed in water. This is an easy way to loosen the seeds because the seeds sink and the pulp floats. Then, I put the pomegranate berries/seeds through a strainer, discard any unwanted remnants and keep only the best. One large pomegranate yields about one cup or less of berries/seeds. ~ This recipe makes three cups of my Natural Pomegranate Jam. 1/2 cup of honey * Ikaria honey has many health benefits; it is rich so use less. In a bowl, add 1/4 cup of lemon aide with the mashed pomegranates and keep the mixture on the side for later. Meanwhile, put 3/4 cup of juice and honey in a pan with the calcium water and boil separately. Then, put this mixture in a blender and add pectin until powder dissolves in juice. Put pomegranate mixture in a pan and bring to a boil. Pour the pectin mixture from the blender into the pan and return to a boil. Remove mixture from heat and fill the warm, empty jars with the jam mixture, leave some room at the top and screw the lids on tightly. When the mixture cools, it will harden into a jam. Put jam in to the refrigerator when the jars are cool. Enjoy! No matter how far or near, the power of love connects us to those who have touched our hearts. That wonderful energy triggers our memory and senses just by listening to a song or eating food. Making Pomegranate Jam renews my connection to a special friend, Robyn Whatley – Kahn who is living on the island of Ikaria in Greece. She specializes in the quality of Archaeologous guided tours to the area where pomegranates first grew, namely Turkey, where some scholars claim is the location of the Garden of Eden. 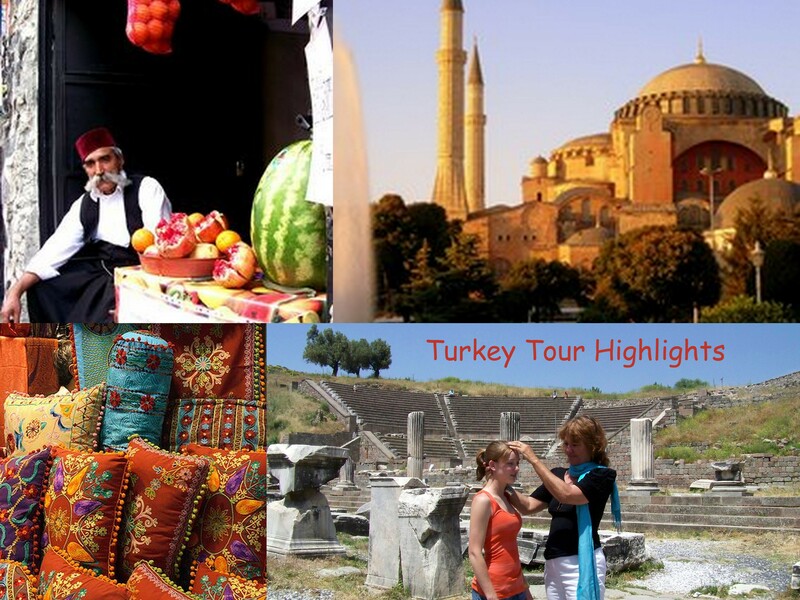 Below, I put together a few pictures that Robyn sent me for a glimpse of the places, people and things that can fill your senses while on an Archaeologous Turkey tour! 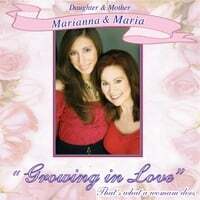 Robyn and I have a past of traveling and entertaining together in the 70’s girl group, The Golddiggers. 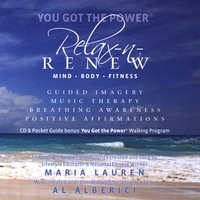 Now, we are both involved in healing, I am an exercise coach/therapist and Robyn is a Body Talk practitioner. The bonds of the past powerfully unite us. 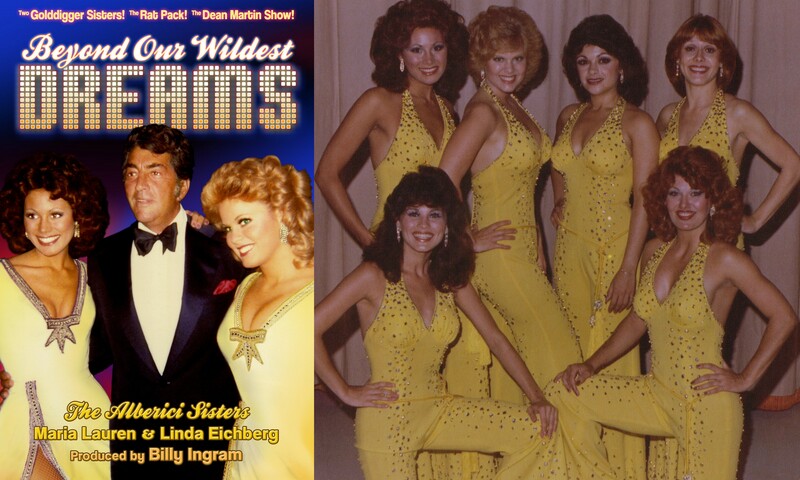 Pictured are Maria Lauren, Dean Martin, Linda Eichberg – (top row) Maria Lauren, Linda Eichberg: Alberici Sisters, Joyce Garro, Peggy Gohl, (bottom row) Patti Gribow and Robyn Whatley-Kahn. In the book, Beyond Our Wildest Dream, my sister, Linda Eichberg and I fondly remember times as members of The Golddiggers during the groovy 70’s. As insiders, we tell backstage stories of entertaining with icons including the Rat Pack. Those who were there, our “Golddigger” sisters and other notables share their viewpoint giving a broad perspective to this special era in showbiz history. It’s a fun time of sisterhood and friendship when the TV Variety Show was prime and celebrity legends ruled the Las Vegas strip. Our readers have found it to be a sweet escape! Statements on this site do not represent the views or policies of my employer, past or present, or any other organization with which I may be affiliated. I have not been paid to promote any product or service on this post. All content is copyrighted.